Attendees representing various education groups listened to students speak on textbooks and open educational resources Friday, when a student panel shared that they’d take more classes, complete their programs at a higher rate and would learn more of the instruction material if they had access to open educational resources, or free learning materials that replace conventional textbooks. College of the Canyons hosted education experts from across the state Friday for a Zero Textbook Cost conference, where students, faculty and policymakers shared their experiences with textbooks and open educational resources. Attendees representing the California Community Colleges Chancellor’s Office, United States Department of Education, 43 community colleges, two California State University campuses and other educational groups packed into the Dr. Dianne G. Van Hook University Center for the Zero Textbook Cost Summit, “which underscores the importance of what we’re doing from a state perspective,” said James Glapa-Grossklag, COC’s dean of educational technology, learning resources and distance learning. “When College of the Canyons surveyed students on textbook costs, two-thirds of our students told us that they don’t buy textbooks,” Glapa-Grossklag said. “Eighty-seven percent of those students told us that not buying their textbooks causes them concern and stress (and) 70 percent of our students tell us they pick classes based on textbooks.” Members of the audience heard students speak about these concerns Friday, when a student panel shared that they’d take more classes, complete their programs at a higher rate and would learn more of the instruction material if they had access to open educational resources, or free learning materials that replace conventional textbooks, Glapa-Grossklag said. These are the motivating reasons why COC is leading the effort to help faculty across the California Community Colleges system develop entire programs that use open source materials, said Hal Plotkin, a senior open policy fellow at Creative Commons and former senior policy advisor at the U.S. Department of Education. 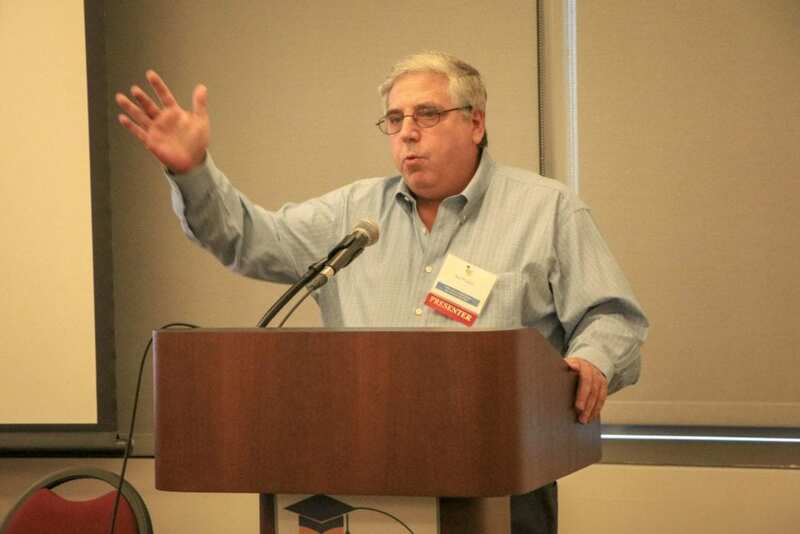 During the Zero Textbook Cost Summit, Hal Plotkin, a senior open policy fellow at Creative Commons, said textbooks will very soon be a concept of the past.